Our team raised $22215 for recent Qld Floods victims! OUR TEAM RAISED $22,215.00 FOR QUEENSLAND FLOODS VICTIMS! 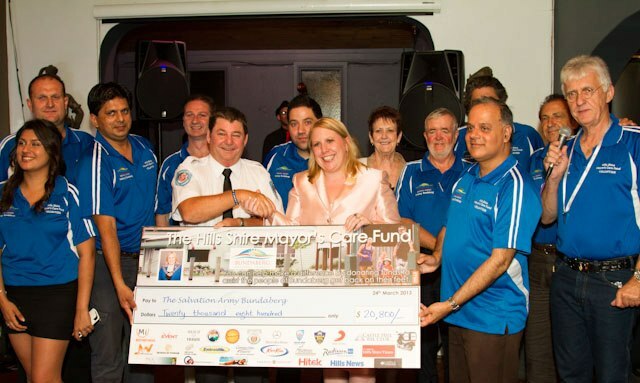 Indian Australian Association of NSW Inc [INDAUS Inc] members teamed with others in the Hills Shire and organised a hugely successful Charity fund raising event for Bundaberg Floods Victims, at Mother India Restaurant, Dural, raising $22,215.00 on Sunday, 24th March, 2013. Earlier on 29th January, our group was having dinner at Mother India when the idea was born to give something back to the community. It comprised of Dr Yadu Singh [INDAUS Inc President], Gareth McCray [Broadcaster & INDAUS Inc member], Ross Colossimo [CEO of The Australian Brewery & Bella Vista Hotel, Sanjeev Sharma [Mother India Owner & INDAUS Inc member], Rajiv Chaudhri [CEO of Hitek Australia & INDAUS Inc member], Poonam Verma [Jewellery Designer from India], and Kanika Chaudhri [Rajiv’s daughter]. This discussion came to focus on the myriad of disasters that had hit Australia since January. We got round to realising that the Regional city of Bundaberg had been worst hit. It was suggested and agreed that we contact the Hills Shire Mayor, Dr Michelle Byrne, and see if she would agree to front a committee to raise some funds to help the people of Bundaberg. We did that and she agreed. A committee was constituted and potential sponsors were decided to run a special Charity Dinner at Mother India. Dr Michelle Byrne, the Hills Shire Mayor, A/Prof Jim Taggart, Joseph Ishak from Skad Australia, Clr Jeff Lowe, John Ebbott, Ms Sonya Phillips [Former Hills Shire Mayor], Journalist Bev Jordan and David O’Neill, the General Manager of the Castle Hill RSL. Meeting on a weekly basis, our team planned the event which included day time markets followed by buffet lunch and a lavish dinner with entertainment, auctions and raffles. Entertainment was provided by renowned singer, Angie Dean and a local Bollywood dance group, organised by Mother India. At $75 per person, the team did not take long to fill the restaurant with 120 people. They enjoyed a three course sumptuous dinner with Beer and wine donated by generous donors, The Australian Brewery, Australian Hotel Association & Castle Hill RSL. Master of Ceremonies for the event was media personality, Gareth McCray and auctioneer was A/Professor Jim Taggart who both brought the electrifying energy and enthusiasm to the event, thus helping in the collection of funds. Salvation Army Officer from Bundaberg, Mr Peter Evans was flown down to Sydney to witness the event. His flights and accommodation were sponsored, organised by the team, at no cost to him. 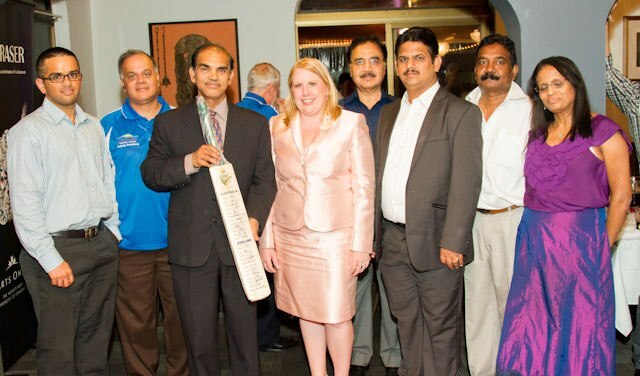 The items for auction included a Cricket Bat signed by national teams of Australia and UK [bid successfully by INDAUS Inc Vice President, Stanley D’Cruz for $2000], Jewellery worth $3500 from House of Fraser, a necklace donated by Poonam Verma and many others. It was an absolute privilege working with each of these people in the team, who all knew fully well why this fund raising was important for the People of Bundaberg. Families and businesses in Bundaberg that had only just started getting on top of things since the previous flood had to watch again as their lives were upended and swept away by the Burnett River that raged with a ferocity that had never been seen before. The floodwaters did recede as quickly as they rose but nothing could prepare the residents for what they found when they crossed back across the Burnett River – some houses had sunk into the ground, others were covered in mud so deep, bed lined in the trees roads turned up. The river turned Bundaberg into a war zone. However the spirit of Faith, Hope and Love grew out of this disaster. A Faith that is based upon the knowledge that we can always rely on each other to help when the need is there. A Love of the friends, family and people from across the nation, such as here in The Hills Shire, who have come to help those in great need. This is what makes the many national multicultural groups that make up Australia so special. We believe that thing we call “mateship” is something we should be so proud of, and which we can show whenever our fellow Australians are in need of. That is why we came together on Sunday March 24 to join in that spirit of Faith, Hope and Love and help the people of Bundaberg. In addition to INDAUS Inc members taking a key role in the project, Indian Australians worked shoulder to shoulder with Hills Shire community and raised this amount for people in Queensland who need it so desperately. We, in INDAUS Inc, were proud to be the key members of the committee, responsible for execution of the project and delivery of the outcome in a substantial way. It was a unique experience for us in INDAUS Inc.
INDAUS Inc is indeed proud to be part of doing something for our fellow Australians.